There is little data on the experiences of bisexual transgender people. Research on LGBT people is growing, but when the data are disaggregated to look at the disparities or resilience of particular groups under the LGBT umbrella, the sample size is often too small to analyze with confidence. 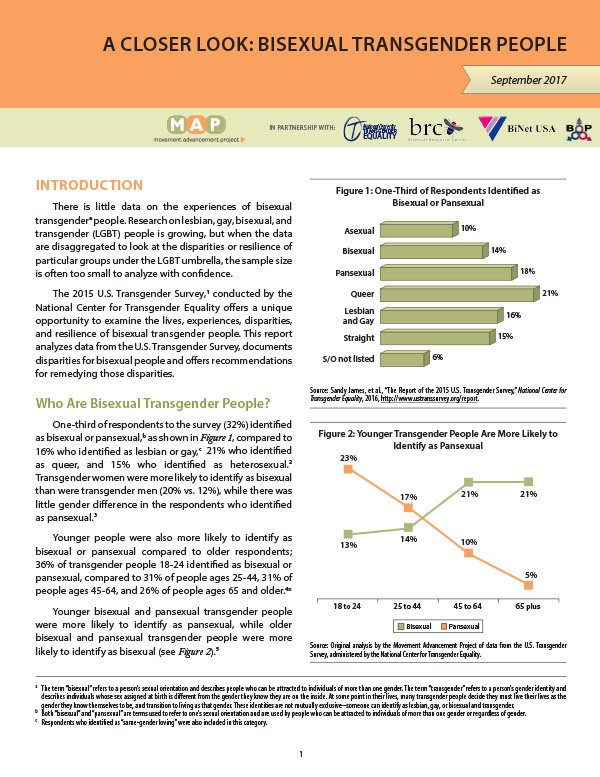 The 2015 U.S. Transgender Survey, conducted by the National Center for Transgender Equality, offers a unique opportunity to examine the lives, experiences, disparities, and resilience of bisexual transgender people. A Closer Look: Bisexual Transgender People analyzes data from the U.S. Transgender Survey, documents disparities for bisexual people and offers recommendations for remedying those disparities. Movement Advancement Project. September 2017. A Closer Look: Bisexual Transgender People. http://www.lgbtmap.org/bisexual-transgender (date of access).